ANAHEIM, Calif., Feb. 6 2018 - Exhibiting its med tech materials capabilities at Medical Design & Manufacturing (MD&M) West, ProAmpac is inviting participants to explore how the company's approach to collaborative innovation could help them. Med tech engineers and executives attending the MD&M West exhibit and conference here, Feb. 6-8, will be introduced to the ProAmpac brand, encompassing medical materials capabilities offered by legacy companies Ampac, Prolamina, and Coating Excellence International (CEI) prior to their acquisition and integration into ProAmpac. 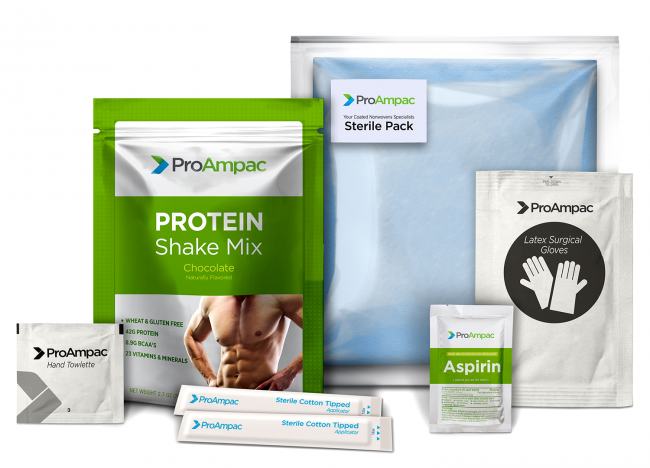 Today, ProAmpac is one of the largest and fastest growing flexible packaging manufacturers in the United States. "We are inviting the medical community to visit Booth 532 and learn more about our products and our commitment to collaborative innovation," said Adam Grose, chief commercial officer. "This is a company-wide initiative through which our technical and research people team up internally and externally with customers to develop solutions tailored to their specific needs." Grose concluded, "Collaborative innovation makes ProAmpac stand apart from our competitors." ProAmpac provides innovative healthcare solutions through a low extractable barrier lamination, called PRO FlexiPURETM. This product enhances the company's existing family of barrier drug- and medical-device overwrap adhesive laminations for the pharmaceutical and medical device markets. The ultra-clean, low-extractable, high-barrier, flow-wrap, foil-free high-barrier lamination, which addresses the amount of trace contaminants found in film structures, has been independently tested and proven to reduce sealant side extractables by 60 percent over solvent-based laminations.
" Drug delivery ProAmpac is the North America market leader in blow-fill-seal (BFS) extrusion and lamination-currently providing form-fill-seal overwraps, pre-made pouches, as well as the PRO FlexiPURE™ family of films mentioned above. The firm's drug delivery packaging includes inhalation, liquid and solid oral dose, injectable, topical/transdermal, and transmucosal applications.
" Medical device Low-extractable barrier lamination and adhesive and extrusion capabilities are used for peelable and non-peelable high-barrier foil and non-foil packaging systems. ProAmpac technologies are found in wipes, syringes, and medical device barrier applications. These include enteral feeding, wound care, casting tape, bone cement collagen hemostat, orthopedic implants, bone and tissue grafts, electrodes, auto injectors and drug-eluting stents.
" Over-the-counter ProAmpac provides flexible packaging solutions for leading over-the-counter pharmaceuticals: poly-coated one-side paper and paper/poly/foil/poly structures for single-dose packaging.
" PRO-BARRIER® Nonwoven ProAmpac is a leader in extrusion coating and extrusion laminating and printing of nonwovens for use as surgical drapes and gowns, patient warming and hypothermia prevention. ProAmpac's multi-coextrusion lines produce coated nonwovens that are soft and drapable, yet pass stringent barrier requirements regarding blood and blood-borne pathogens.
" High-Speed Film Flexi-Free high-speed (HS) laminate films can be used in high-speed form/fill/seal machines where increased speed is critical to throughput efficiencies. The films heat seal at temperatures 40 degrees lower than standard laminate materials, allowing the machine operator to shorten dwell times and increase machine speed. Pouch-making speeds can typically be increased 20 percent or more on high-speed, horizontal form/fill/seal machines, creating greater operational efficiency. Additionally, Flexi-Free HS provides a low-temperature solution for packagers that may be handling and packaging products that are heat sensitive and should not have prolonged exposure to higher temperatures. The high-speed technology, manufactured in a solventless process, can be applied to many types of laminations such as metalized PET, foil and clear film laminations, making the film highly versatile for various end-market applications such as pharmaceutical, personal care and consumer products.